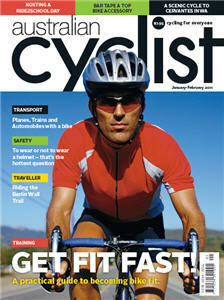 In the Jan / Feb edition of ‘Australian Cyclist‘, Dr Michael Dinh sets out the case for mandatory helmet legislation. In previous posts, I have discussed how the article acts as little more than anti-cycling propaganda by painting cycling as an extremely dangerous sport, and how his premise that ‘helmets prevent injury’ simply does not lead to the conclusion that they should be mandatory. In this post, I shall look at the research data Dr Dinh presents to support his case – research that I presume underlines the article subheading – ‘the hard clinical reality’. I apologise in advance, but this post gets a bit technical with a discussion of research methodology. However, once again it’s worth pointing out that this is not a discussion about whether helmets ‘work’. Indeed, the conclusions I reach once again remain valid irrespective of their efficacy, and as such should be embraced by everyone whatever their views on the wearing of helmets. However, before we start talking about Dr Dinh’s research, I’d like to take you on a bit of a detour into something rather different – hormone replacement therapy. HRT, as most people know, involves giving women hormones as they enter the menopause, to help relieve the symptoms. It was quickly established that HRT reduced the risk of osteoporosis (brittle bones), and about twenty years ago doctors became interested in whether taking HRT had any other protective effects, for example on heart disease. A number of studies were undertaken, and it appeared that HRT had a significantly protective effect on cardiac disease. For example, one study notes: ‘four cross-sectional studies … have provided some of the most convincing evidence that estrogen replacement reduces cardiovascular risk in postmenopausal women‘. This led to the development of clinical practice where doctors routinely prescribed HRT to their patients in order to protect them against heart disease. It is instructive to take a look at how these studies were undertaken. The methodology was quite straightforward; take a group of patients and divide them into two groups – those taking HRT, and those not. Then look at their medical records and compare the outcomes for both groups. This study, for example, looks at the survival rate following heart surgery. When the HRT (also called ERT; ‘estrogen replacement therapy’) and the non-HRT groups are compared, the group taking HRT live on average much longer; as the study notes: ‘These data suggest that ERT improves survival significantly‘. All very compelling stuff, and the basis for clinical practice for many years. It was accepted by doctors that HRT protected against cardiac disease – this is what they were told when they trained, and this is what they told their patients. Unfortunately, it was completely wrong. In fact, taking HRT actually increases the risk of heart disease in women. Women who may be taking HRT to prevent heart disease are now urged to see their doctor to see if they should stop. So what happened? How did those studies get it so wrong? The answer is quite simple, and bedevils all attempts to use medical case data to compare different groups. The studies assumed that the groups of women were similar in terms of cardiac health risks, aside from their HRT usage. This, as it turned out, was a very flawed assumption. The problem is that people choose to take HRT; it is not something that is randomly applied to some people and not others. This means that, along with that choice, go other related factors. Women taking HRT are more likely to be of a higher socio-economic background, for example. They are more likely to eat healthily and do exercise. And so on. And his is what the studies I discussed before had actually discovered – that people who choose to take HRT are also more likely to make healthy lifestyle choices. This means they do tend to live longer – but despite, rather than because of, the HRT! So what does this tell us about bicycle helmets? Well, many studies looking at the effectiveness of bicycle helmets are undertaken by comparing the post-accident medical outcomes of riders who choose to wear helmets and those who chose not to. Let us pause there for a moment, and reflect on the HRT example again. There are lots of reasons why people might make a particular choice, and it is likely that that those reasons will also influence other (perhaps unrelated) aspects of their behaviour. Could it be that people who choose not to wear helmets might also behave differently in other ways too? And is it possible that those behavioural differences might also affect the risks they run whilst riding a bicycle? One way to see if this could be true is to look at the overall injury severity of cyclists who choose to wear helmets compared to those who choose not to. This has not often been done; however one notable study from the US did look at this. Interestingly they found that riders who chose not to wear a helmet were more likely to have serious injuries, even if head injuries were excluded. In other words, for some reason non-helmeted cyclists were having more serious crashes. This is not the only study to have seen this effect; for example this Australian study also found that unhelmeted cyclists suffered more severe injuries to their extremities and pelvis. Several studies (including the two cited) have also found that unhelmeted riders suffer worse facial injuries, even though bicycle helmets do not cover the face. These data seem to show that, along with the choice not to wear a helmet, other choices are also made that tend to increase the severity of cyclist injuries. None of the studies can tell us why that should be so, but we could make some educated hypotheses. For example, perhaps people who choose not to wear helmets like taking risks; choosing not to wear a helmet is one ‘risk’ which perhaps goes along with others such as riding faster or more aggressively. Such hypotheses are not important, however, to the overall conclusion. Bearing in mind the cautionary tale of HRT, when we compare groups of people making an active choice and see differences in outcomes between those groups we should be cautious about drawing too firm a conclusion lest there are confounding variables. When we have further data that to show that such confounding variables definitely exist, then we should toss out this type of study design and instead look to use a more robust, randomised methodology that eliminates this error. So what does this have to do with Dr Dinh’s article in Australian Cyclist? Quite simply, Dr Dinh references a study he undertook with a colleague that compared the head injury outcomes of helmeted and unhelmeted cyclists admitted to his hospital. He notes that helmeted cyclists have less severe head injuries, and uses this as the ‘hard clinical reality’ that underlines the need for mandatory helmet laws. However, Dr Dinh’s paper is flawed. In it, he does not even discuss the possibility of confounding variables. He is apparently unaware of the dangers of this experimental design. He does not reference studies that illustrate that there could be a problem. Interestingly he does note that helmeted cyclists also had less severe facial injuries, but even this apparently did not set off any alarm bells, nor apparently prompt Dr Dinh to look to see if there were any other differences, for example in the injury severity of other parts of the body as found in other similar studies (although it should be noted that the absence of such differences does not remove the possibility of confounding). One rather gets the impression that Dr Dinh already believed that helmets ‘work’; indeed he actually admits that in the article when he notes ‘our distant medical training reminds us that helmets do protect from head injuries‘. It seems that this belief is blinding Dr Dinh to undertaking proper sceptical enquiry and making it difficult for him to see the potential problems with his research approach. It should be noted that the poor quality of Dr Dinh’s research in no way adds weight to the argument that helmets ‘do not work’. Dr Dihn fails to provide compelling evidence that they do, but this is not the same thing as saying such evidence does not exist. If there is one thing to take from this, it is that much research in this field is of very low quality. (Indeed, many people will remember another Sydney academic, Dr Chris Rissel, recently withdrew a paper he had published about bicycle helmets because of data errors – a paper that (perhaps ironically) claimed that increased rates of helmet wearing had not improved cyclist head injury rates in Australia). This makes it very difficult for anyone to properly weigh up the arguments without spending a lot of time researching the issue and reading endless rather dry papers and critiques. Perhaps because of this, may people short-cut proper sceptical enquiry into this topic, and instead rely on intuition – which ultimately makes for a very low quality of debate on this issue. Something that is unfortunate for everyone. The Black Forest is a dense, fir tree forest in southern Germany. It is famous for two things; its giant earthworm and for its cake. The giant earthworm Lumbricus badensis, found only in the region, grows to lengths of sixty centimetres, and lives in burrows up to three metres deep. The cake, Schwarzwälder Kirschtorte, is made with chocolate, cream, sour cherries and kirsch liqueur, and lives on 1970s dessert trolleys. I think it is safe to say that Arnott’s took their inspiration for these biscuits from the cake, rather than the worms – indeed the pack notes that this is a ‘dessert inspired biscuit’, and includes a small picture of perhaps the actual dessert that was used as the muse. 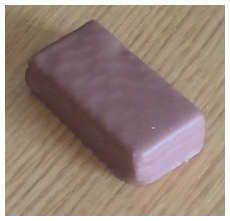 As such, the regular chocolate cream filling of the regular Tim Tam is replaced with a combination of white cream and cherry flavoured fudge, with the fudge down the centre of the filling with cream either side. The pack artwork implies that this fudge is quite liquid, and spills out enticingly perhaps even in the manner of a liqueur. However, the cherry filling is actually quite chewy, with a consistency closer to soft toffee. The major disappointment with these biscuits was the chocolate coating. The pack artwork suggests that it might be dark chocolate, which I thought would add a degree of sophistication. However, it is in fact milk chocolate – but oddly not the same chocolate that is used on the regular Tim Tam. It is I think slightly darker, and actually strikes me as being lower quality, although this may be an artefact of the rather sweet chewy filling interfering with the palate. The other disappointment was that there seemed to be no kirsch; a mandated ingredient in a Black Forest cake, according to the Deutschtortegesetzgebung. I suspect this is because of the outcry when Arnott’s last tried marketing an alcoholic Tim Tam, the Tim Tam Tia Maria, which was subsequently withdrawn from sale. I’m not really sure about these; they do have a kind of retro appeal, which I suppose is the point. However, they just don’t quite work; something is lacking. (Indeed, two whole biscuits are lacking, as for some reason you only get nine in a pack, as opposed to eleven in a regular pack.) I’m going to give these a six out of ten. I like to think I am on the cutting edge of bike fashion, but there seems to be new craze out there which I have not yet adopted. It is the ‘bum hanging out of your shorts’ look. Almost every ride over the last few days has involved riding behind someone who has adopted this style. Not that I mind; I’m all for feeling free and letting it all hang out. Although the rather hairy backside of the guy I followed over Anzac Bridge last night wasn’t the best view in Sydney; the image on the left is from tonight’s ride home over the Harbour Bridge and was much more attractive. Is this a look I should be emulating? Does a cool breeze over the derriere make for a more pleasant ride in hot weather? Is it more visible in traffic? Your thoughts would be welcome! On Thursday last week it was Baby Chillikebab’s first birthday. A momentous event that the North Sydney police evidently felt the need to mark by patrolling the foot of the Sydney Harbour Bridge cycleway staircase looking for commuting fathers trying to get home early. As I rolled up on the Radish, the two cycle cops called me over. Sigh. Here we go again. It seems the nonsensical police crackdown on dangerous cycling scofflaws is still in force. Cue normal slightly puzzled expression, and then ensuing dialogue. They weren’t as busy as the last time, so I was able to have a bit more of a chat with them. At one stage the officer actually taking my details seemed quite interested in the issues and the supporting evidence, but his colleague warned him to ‘not get into a discussion about the research and all that stuff’. There was one quite comical moment when I asked him if he was actually going to give me a ticket, or, given that I had received a ticket just a few weeks before that was still pending review, he could perhaps exercise his discretion and simply give me a warning. “I’m going to have to give you a ticket because you already had a warning, and, well, you didn’t learn the lesson, did you?’. As he said this, his voice tailed off as he realised how nonsensical this sounded when faced with someone who has absolutely no intention of wearing a helmet, and can spout dozens of research articles to support his position. I then had a nice chat with them about how I might be able to combine the two tickets into the same court appearance, to save time – they were most helpful. And we then had a chat about the Radish; they were quite enthused and interested if it could carry a passenger. Perhaps I should have offered to take one of them for a ride! Anyway, it now seems I will get another ticket. What a complete waste of everyone’s time and money. Whilst the policeman was taking my details, a car drove through a red light at a nearby pedestrian crossing. I pointed this out to the officer, and asked him whether he considered this a more serious crime than me riding a bike without wearing a polystyrene hat. He dodged the question, saying that they were there to enforce all aspects of the law and were looking out for rogue drivers, cyclists and pedestrians. I was tempted to say that they weren’t going to nab many rogue motorists as they were positioned thirty metres away from the road, but I refrained. 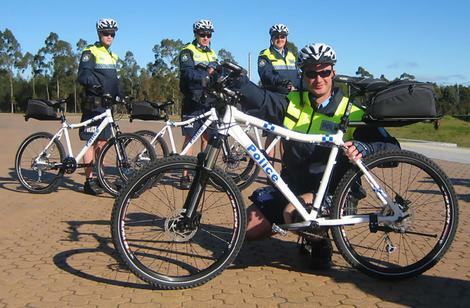 (Note: the image is a library pic of a NSW police bike squad; I forgot to take a picture of the actual officers involved). Well here’s a fascinating thing. This biscuit has a lot in common with this one. The same claim to lots of ‘real fruit’. The same long, flat slab. However, there are two differences. The Sultana Choc is covered in chocolate, and is good for you. The Full O’Fruit lacks the chocolate, but makes no claims to healthiness. Is this proof that chocolate is healthy and good for you? This could be the information that Mrs Chillikebab has been searching for! A closer inspection reveals that there are other more subtle differences. 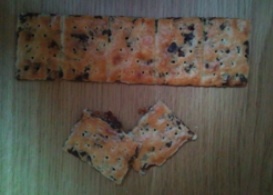 The Full O’Fruit is slightly shorter, at only 19cm, The biscuit has a softer texture, which means this biscuit rather lacks structure. And the fruit seems somehow less succulent. This is clearly Arnott’s out to deliver the exception to prove the rule that ‘healthy’ biscuits are inferior to their full-fat cousins. There’s nothing wrong with the Full O’Fruit; they are quite pleasant. But they are not a great biscuit – if you want my advice, stick to the ‘Snack Right’ variety. I’m going to give these a five out of ten. When you google ‘Gaiety’ you find out that it means ‘a state of joyful exuberance’. I wonder if this is how the Arnott’s recipe development team felt as they came up with this biscuit? I have a picture of white-coated, normally rather serious food economists and biscuit technitions dancing around the lab egging ech other on. The result of all this exuberance is a quite tall, squarish wafer biscuit coated in milk chocolate. There are five layers of wafer, sandwiched together with chocolate cream. So how does it all work? Well, it’s a bit odd. 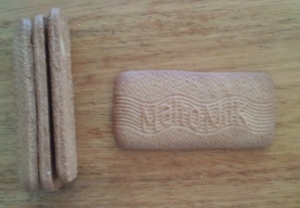 You could best sum up this biscuit by calling it ‘not quite a Tim Tam‘. It has the same chocolate coating and the same chocolate cream – but instead of the crunchy Tim Tam biscuit it has layers of crispy wafer. The Tim Tam is definitely a superior biscuit. So why would anyone buy these? I mean, they are quite nice; really rather pleasant. And that’s even allowing for my prejudices about wafers. But if your hand was hovering over these in the supermarket, you’d surely find yourself picking the Tim Tams from the next shelf instead. Perhaps there are people out there who just love wafers. If you are one of them, and can explain why you prefer these biscuits to Tim Tams, please let me know – I’ll send you a packet of Gaiety biscuits for your trouble. In the meantime, I’ll give these a six out of ten. Gondolas. Gondoliers. Italian romance. Window blinds. Arnott’s have attempted to distill all of these into biscuit form in the Venetian, an iced fruit biscuit. Somehow, you don’t get a good feeling about the Venetian from looking at the packet. It has something of the Monte Carlo about it; potentially rather overdone and try hard. However, to sample a Venetian is to be pleasantly surprised. The fruit biscuit is crisp and moreish; the topping sweet but not overdone making the whole thing really rather good. It rather reminds me of a Johann Strauss waltz; actually much better than you expect; really quite skillful and not over sugary. Perhaps they should have been called ‘Viennese’, rather than ‘Venetian’. A fine biscuit that deserves a solid eight out of ten. I was a bit late leaving work yesterday. I had to get back, as Mrs Chillikebab had her first dance class of the year that day, and was very keen to attend. I was on a three-line whip to be home by 6pm. It’s about a forty minute ride, so I really needed to scoot out not long after five to be sure of getting home on time. However, it had gone twenty past five as I wheeled the bike out of the lift, and the need for a swift ride home was very apparent. I should have realised at that point that things were not going to go well. 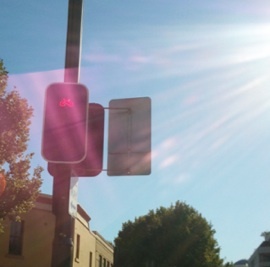 There are two reasons why you get lots of red lights; one is when the weather makes waiting at the lights unpleasant. The other is that you are running late. I copped that double whammy in spades. Every single traffic light was red. Every single one. Out of the office, first lights on Miller St: red. Pac highway junction: red. Blues Rd: red. Lavender St: red. Pedestrian crossing: red. All the bike lane lights in the city: red. So I just had to wait there in the blistering sun, heat coming up form the tarmac like a sizzling BBQ plate, clock ticking away. I might have considered blasting through some of them like the fixie scofflaw that I aspire to be, but the traffic was also against me; not gridlocked to weave through, but not light enough for there to be gaps. I finally got out of the city and onto Anzac Bridge. By now I feel very late, so I push hard up the hill battling both the incline and the oppressive temperature. Keep pushing through, onto the local roads, push push push up one last final hill to the house. Drop bike in yard and run into the house. “I’m here!’ I gasp, perspiration dripping from my beetroot red face, legs trembling from the effort. It’s one minute past six. The wisdom of women: building in a margin for error where their husbands are concerned. What do the apostrophes in ‘Malt’O’milk’ represent? If they represent missing letters, then presumably the un-contracted name of these biscuits has a middle word with an ‘O’ in the middle. Malt More Milk? Malt Sour MIlk? Or perhaps they are quote marks rather than apostrophes, perhaps referring to someone’s name. However, I only know of one literary character called ‘O’, and it seems very unlikely that Arnott’s would name a biscuit after her. Or perhaps the type of malt that finally was considered perfect and ready for production during development of these biscuits was the fifteenth variety, after ‘Malt ‘A’ Milk’, ‘Malt ‘B’ Milk’ and so on. They are quite crunchy with a high bake, with a sort of slightly spicy taste; the maltiness is also quite distinct. For some reason they remind me of those little biscuits you sometimes get in foil wrappers when you order a coffee in France. The shape, high bake and taste lend themselves admirably to dunking; this is a biscuit that was just made to be dipped into a cup of tea. (I suppose, given my earlier comment, they might also go with coffee, but as everyone knows you don’t have biscuits with coffee. Not unless you are in France.) It’s very easy to polish off a while pack in this way, although you do get a lot of biscuits in a pack so it takes a while and the tea can go cold in the process. I’d give these a seven out of ten. Really quite good.